Born and raised in north Minneapolis, Shaadia Munye, 18, has always believed she would go to college. Her parents came from Somalia, where education was not an option for most people. But for Munye, it is a must. "It's like when you think of your success and happiness, it's college," Munye said. Munye will study nursing and social work at Augsburg University this fall. Munye, a recent graduate of Minneapolis' Patrick Henry High School, was among the hundreds of young people who made their way to downtown Minneapolis through the North Side Friday. The neighborhood was the scene of two fatal shootings last week, including one by Minneapolis police officers that sparked two days of peaceful protests. Friday's march was planned before the violence, however. Some marchers held signs that read: "We're going to college." 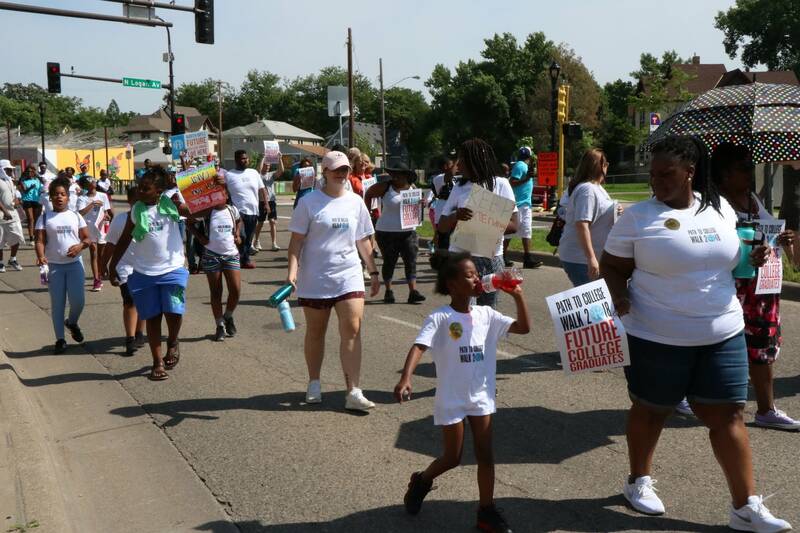 At the third annual Path to College Walk, parents, teachers and members of the community walked with the young people along the way. The sidewalks were stenciled with recent high school graduate names. Friday's near 100-degree temperature shortened the walk, but not their determination. College education is "a prerequisite to succeeding in today's global marketplace," said Sondra Samuels, CEO and president of Northside Achievement Zone, a nonprofit that has hosted the march since 2016. "It's a prerequisite for an opportunity." Samuels said she has seen a difference since the marches; children have increased hope in what their future holds. "We say we believe in you, no matter what society has thrown at you, no matter what is happening in your home, no matter what is happening in the schools, we believe in you," said Samuels. " You can do it and we have your backs." Alika Galloway, CEO of 21st Century Academy, brought her students to the march. Galloway is a first-generation college student, who graduated from a community college. "I went two years at Columbia in Missouri. When I came home and said I did it, it was the first and only time I saw my father cry," said Galloway. "That's the story of our people here in north Minneapolis." Community members came out to cheer on the students, some honked from their cars and others waved from their front yards. Galloway recalled a woman during the last year's march. "One woman yelled out the window last summer, 'babies, go for me, babies, go for me,'" she said. "That was a profound change that not only that they could go but that they also had the commitment to be legacy bearers." "Oh my god, are you really going to college?" a smaller girl asked Munye. "I wish I had something like this when I was younger so I could see people that look like me doing the things that I wanted to do in my future or things," Munye added. "Now I feel like they feel they're capable."